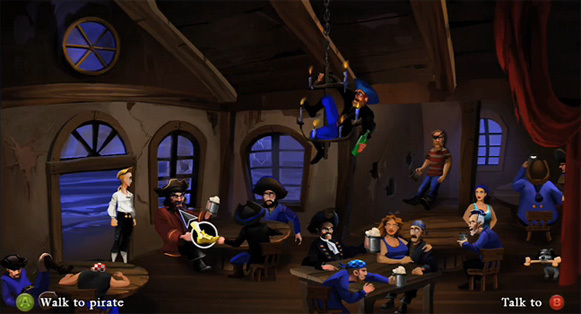 Lucasarts have just released further details on the forthcoming Monkey Island remake for Xbox Live Arcade, along with the news that it’ll also be available for Windows. Sadly no news on whether it’ll make the Playstation 3, Wii or Nintendo DS. The latter would be especially interesting as the stylus-based interface would be ideal for this kind of game. The Secret of Monkey Island: Special Edition stays faithful to the original but with new brand new 2D artwork and audio. It also has its own website. Well, a widget, anyway, with a tiny video stuck in it. If you want to view it in full HD you’ll need to head over to their Facebook fan page and check it out it there. But that’s not all! It’s also been announced that Telltale Games, the team who produced the new Sam & Max series, are producing a brand new episodic Monkey Island adventure for PC: Tales of Monkey Island. Like Sam & Max Season One and Two, the new games will be 3D-rendered and split into five downloadable episodes, released monthly.